Dr Gonsalves said that his government, since it came to office seven years ago, has been a champion of the cause of teachers and said that it is widely accepted that public servants and teachers have never had it as good as they do under his administration. He noted that the entire reclassification process will cost the government $20.8 million to implement, and suggest that the government is being fair. However, even before Dr Gonsalves made his statement in Parliament, officials from the St Vincent and the Grenadines Teachersâ Union (SVGTU) held a press conference to formally announce their decision which was taken at a general meeting the night before. Matthews said that she was confident that the membership of the Union would rally together for the call to strike on Monday, October 13th. Teachers followed through on their strike threat and hailed the first day a success. However, the Minister of Education Girlyn Miguel said she believed that the strike was largely unsuccessful in secondary schools, but had a big impact on primary schools. Several schools, especially primary schools on the Windward side of the mainland, were forced shut due to the action taken by the teachers. An official at the Ministry of Education told SEARCHLIGHT that the Ministryâs investigation showed that 50 per cent of the primary school teachers responded to the Unionâs call, while 85 per cent of the secondary school teachers ignored the call to strike. Meanwhile, Minister of Labour Rene Baptiste intervened and summoned the Executive of the St Vincent and the Grenadines Teachersâ Union (SVGTU) to a meeting. However, while president of the SVGTU said that the meeting with the Labour Minister was good, she told SEARCHLIGHT that it did not alter the Unionâs position and that industrial action would continue on Tuesday, October 14.
âThe strike continues,â Joy Matthews said. The Union also called on its members to prepare to picket outside the Government administrative building on Wednesday, October 15. While teachers continued strike action, the government had something new to worry about. The Public Service Union (PSU) called an extra-ordinary general meeting and the 46 members present voted to commence industrial action to indicate their rejection on governmentâs seven per cent offer on the mid point of the salary scale in the reclassification exercise. 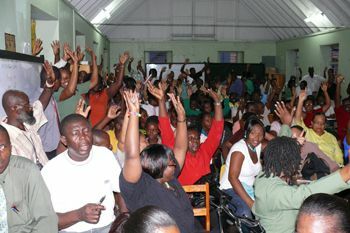 Representatives from the St Vincent and the Grenadines Teachersâ Union (SVGTU) were on hand at the meeting of the PSU and would have been heartened to hear many who were present demand that the PSU join the SVGTU and take a more aggressive stance. âThe teachers are out of the classes. Why has the PSU taken no action?â one member asked. Meanwhile, earlier in the day, Minister of Education and Acting Prime Minister Girlyn Miguel said that she is playing the unfolding crisis by ear, and called on teachers to reconsider the strike action. She said that her officials assured her that the strike action has largely been ineffective in the secondary schools. Dialogue will take place, but the struggle will continue. That was the declaration of President of the St Vincent and the Grenadines Teachersâ Union (SVGTU) outside the gates of the administration building, in the midst of her Unionâs peaceful demonstration. The Union had called out its membership to picket the administrative building which houses the office of the Prime Minister and the Ministry of Finance. Teachers and sympathizers gathered, and at one point, the protestors reached close to 200 in number. As they sang songs of protest and paraded their placards, they made known their rejection of governmentâs seven per cent on the mid point of the salary scales in the R-2 of the reclassification exercise. A midday meeting with a government team, including Labour Minister Rene Baptiste, Budget Director Edmund Jackson and Labour consultant, Joseph âBurnsâ Bonadie, did not change the Unionâs position. Another meeting was scheduled for yesterday between the SVGTU, the Public Service Union (PSU) and the Director of Finance and Planning, Maurice Edwards. While President of the SVGTU Joy Matthews said that her team planned to attend yesterdayâs meeting, she said that the strike would have continued, and teachers were being asked to continue the picketing outside the administrative building yesterday. Meanwhile, the PSU held a press conference to officially announce the decision which they made the previous day, which is to reject the governmentâs reclassification offer, and commence industrial action. âIs the government really taking public servants for a ride?â asked Elroy Bloucher, General Secretary of the PSU, as he said that the PSU and the other unions were being very reasonable in their dealings with the government on the reclassification issue. PSU President Cools Vanloo confirmed that a letter had been sent to government informing them of the Unionâs position. He told journalists that the industrial action is in pursuit of a speedy and satisfactory resolution of the matter.